As Dukhi grew up, he began to go to school. The teachers were astonished observing his great acumen. In a very short span of time the child was able to amass a great deal of knowledge in Sanskrit grammar, poetry and rhetoric. From his very childhood, Dukhi was keenly attracted to the pastimes of Lord Gaura Nitai. From his very early days, he wanted to surrender himself unto their lotus feet. His pious parents always encouraged their child and did not hinder his spiritual progress. Growing up, Dukhi expressed his desire to accept Vaishnava initiation from Sri Hridaya Caitanya, his eternal spiritual master. Taking their blessings, Dukhi started for the sacred land of Ambika Kalna. Crossing Navadvipa and Santipur, he finally arrived at Ambika Kalna. Upon reaching Kalna, he became greatly ecstatic, anticipating the long-awaited union with his spiritual master. Asking the whereabouts of Hridaya Caitanya, Dukhi finally arrived at the residence of his Guru. Surrendering unto his lotus feet, Dukhi introduced himself and expressed his keen desire to accept initiation from him. Hridaya Caitanya was pleased with the sweet words of this young boy and named him as Krishna Das. From that day on, Sri Krishna Das assiduously served his guru. Sri Hridaya Caitanya waited for an auspicious day and initiated him into the Radha-Krishna mantra. Krishna das soon became fixed in his service. Seeing Krishna Das’s determination, his bhakti, and his deep intelligence, Hridaya Caitanya instructed him to travel to Vrindavan and seek out the guidance of Sri Jiva Goswami. He wanted Krishna das to stay and study in Vrindavana in order to further develop his philosophical understanding. Following the instructions of his Guru, Sri Krishna das started off for Vrindavana. But on his way, he met and sought the blessings of all the senior Vaishnavas. On his way to Vrindavan, he passed by Gaya, where he was overwhelmed with ecstasy contemplating upon the initiation pastimes of Lord Caitanya. When he went to Kasi, he took darsana of the senior devotees like Kasi Misra and Chandrasekhara. In this way, Syamananda Prabhu (Krishna Das as he was then called) teaches us how we should take permission and blessings of our seniors before we try to enter Vrindavana. The causeless mercy of the spiritual master and the senior Vaishnavas is our only hope to advance in our spiritual lives. We observe that another stalwart Vaishnava, Sri Srinivasa Acharya, similarly takes shelter of his seniors before entering Vrindavana. ‘The Gaudiya treasures of Bengal’ has covered the life and pastimes of Srinivasa Acharya in a separate article entitled – ‘Sri Srinivasa Acharya’s Sripat, Jajigram (Near Srikhanda, Katwa)’. On reaching Vrindavana, Krishna Das sought out the bhajana kutira of Jiva Goswami and surrendered at his lotus feet. He introduced himself and revealed to him everything. Sri Hridaya Caitanya had previously informed Sri Jiva of Krishna Das. He had requested Jiva to teach him well. After Krishna das had sufficiently gained knowledge in scriptures and after his mind had been well fixed, he could be sent back to Bengal. In no time, Krishna Das became very close to Sri Jiva Goswami, who gave him the service of drawing the water from Kanana Kunja and cleaning the groves daily. His service pleased the divine couple, Sri Radha and Krishna, so much, that they wanted to reveal themselves and bestow their mercy upon him. The amazing pastime that followed shall ever be glorified in the pages of Gaudiya history. While cleaning the groves, Krishna Das discovered a beautiful anklet. Just by touching it, he was immersed in a wave of transcendental ecstasy. He could then understand that the anklet was not ordinary and that it must be belonging to some exalted personality. The anklet actually belonged to Srimati Radhika, and it had dropped from Her foot while She was manifesting Her eternal pastimes at that grove, the night before. Srimati Radharani along with Her associates came searching for the anklet, the next morning. Disguised as an old lady, Lalita Sakhi, asked Dukhi Krishnadas if he had found any anklet lying there in the grove, to which Krishna Das replied in the affirmative. But when she asked him to return the anklet, Krishna das refused as he doubted that the old lady was actually its owner. There was a long conversation between the two. Seeing Lalita Sakhi almost getting defeated, Srimati Radharani had to intervene. Obtaining the darsana of Vrindavaneshwari, Dukhi Krishna das fainted in ecstasy. On regaining his consciousness, he returned the anklet to its rightful owner. Radharani then blessed Krishna das by creating a special Tilaka Mark (noopur tilaka) on his forehead with Her ankle bell. Being pleased with Krishna Das, Srimati Radharani gave him the name Syamananda, which means one who brings great joy to Syama (Krishna). She also gifted Syamananda with the most enchanting deity of Syamasundara. Sri Syamasundara jiu’s temple continues to exist and is one of the seven great temples of Vrindavana. This temple is presently under the care and maintenance of Syamananda prabhu’s disciples. Simply by taking darsana of merciful Radha Syamasundara jiu, one gets to taste the ecstatic mellows of Krishna Prema. While in Vrindavana, he (Dukhi Krishna das) was given the name Syamananda because he brought great joy to Syamasundara. When Jiva Goswami saw his charming activities, he kept him near and instructed him in the Vaishnava scriptures. From Nityananda Das’ Prem Vilasa, we come to understand, that it was Sri Caitanya Mahaprabhu’s earnest desire that the books written by the Goswamis, be brought from Vrindavana and studied in Bengal because Bengal was very dear to Him. He wanted all these books to be translated in Bengali so that they could be relished by the Bengali devotees and enable them to further His mission. Also, there is another pastime in which the deity of Sri Govinda Dev jiu in Vrindavana personally spoke and instructed Sri Jiva and Srinivasa Acharya to distribute these books. Thus, Sri Jiva Goswami requested Sri Srinivasa Acharya, Narottama Das Thakura, and Syamananda Pandita to carry all these priceless books from Vrindavan to Bengal. After taking due permission from the senior Goswamis and their worshipable deities, the three of them set out for Gaudadesha (Bengal), carrying the treasure of these transcendental books. The books were loaded into huge trunks, which were then locked and securely placed upon a bullock cart. Sri Jiva Goswami then gave the three enough money and men to accompany them during the journey. They traveled all the way from Vrindavana to Bengal, taking the path through the Jharikhanda forest. Tears filled their eyes and ecstatic symptoms appeared on their bodies just remembering how Sri Caitanya had taken the same route while traveling to Bengal from Vrindavana. During nights, they halted at suitable places to rest and continued from there the next morning. Soon the bullock cart entered Bengal and reached the borders of Bishnupur. But Sri Gauranga had other plans. An incident then took place which not only shook the three devotees carrying these books but also the entire devotee fraternity from Vraja to Bengal. While the devotees rested for the night at Bishnupur, the books got unfortunately stolen, sending the devotees in a state of frenzy. These books that were stolen constituted the very pillars of our sampradaya, the very essence of Sri Caitanya Mahaprabhu’s movement, that have taken years for our dear Goswamis to compose. Srinivasa Acharya, Narottama Das, and Syamananda Prabhu wandered from village to village like madmen searching for the stolen books. They didn’t want to maintain their lives after this catastrophe. The stolen books included gems like Bhakti Rasamrita Sindhu, Ujjvala Nilamani, Vidagdha Madhava, Lalita Madhava, Hari Bhakti Vilasa, Sat sandarbha and Sri Caitanya Caritamrta. It is a lengthy pastime that ended with Srinivasa acharya, ultimately recovering the books and finally initiating the culprit Bir Hambir, who happened to be the king of this province. Sri Caitanya Mahaprabhu’s lila is exceedingly deep and very difficult to understand. He has a million ways of distributing His mercy. The stealing of these books were His means to deliver the kingdom of Bishnupur and its king Bir Hambir, who went onto become one of the most exalted and exemplary vaishnava kings of bengal. Bir Hambir ushered an era of devotional service and sankirtana yajna in Mallabhum, the glories of which are sung even to this day. That is why it is stated that the magnanimity of Sri Caitanya Mahaprabhu is very unique, very miraculous (Caitanya candra doya koro vichar, vichar korile citte paibe chamatkar). 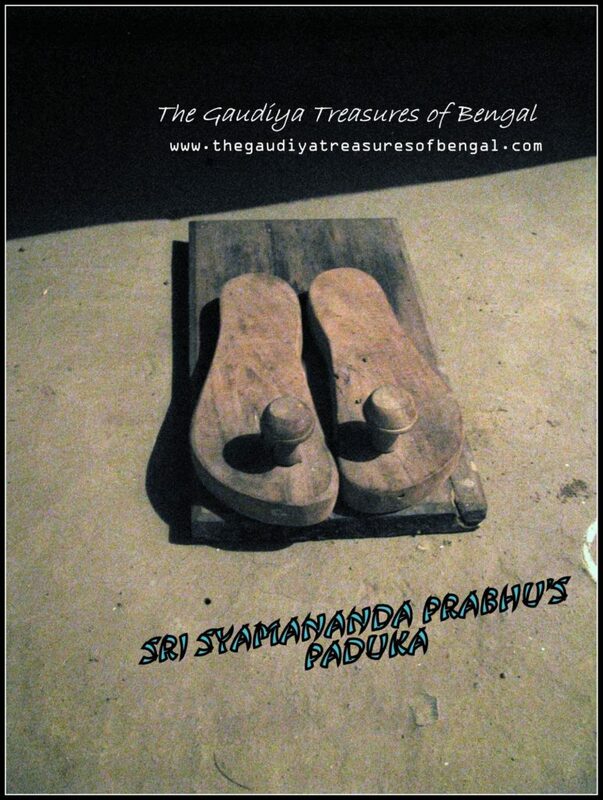 ‘The Gaudiya Treasures of Bengal’ has covered this pastime in detail in a separate article entitled – ‘The Glories of Bishnupur (the temple town of Bengal) – Part 1 :Srinivasa Acharya and Bir Hambir’. From Bishnupur, Syamananda Pandita had returned to Ambika kalna, where he first offered his obeisances unto his spiritual master and narrated to him all the experiences of staying at Vrindavana. He stayed at Kalna for a few days before continuing on his journey. After traveling for a few days, he arrived at his hometown at Dharendra. Feeling compassionate, he began preaching vigorously there and delivered countless rogues and atheists. There was one Government official named Shera Khan, who out of envy, had once attacked and plundered a sankirtana party. Under his orders, the devotees were beaten and their mridangas were broken. On hearing this news, Syamananda Prabhu became furious and as a result, the envious soldiers began vomiting blood. Their beards burst into flames. Shera khan realized his mistake and fell at Syamananda Prabhu’s feet the very next day. He related to him how God had appeared in his dream the previous night and had slapped him. God had ordered him to beg forgiveness at the lotus feet of Syamananda Prabhu. Seeing Shera Khan beg for mercy, Syamananda Prabhu felt compassionate. Shera khan was later initiated by Syamananda Prabhu and went onto become a great devotee of the lord. He came to be later known as Caitanya Das. Syamananda Prabhu then preached in the village of Rayani (near Jhargram) where he delivered the king and the prince. The prince, Rasikananda Murari, became one of the most intimate associates of Syamananda Pandita and was instrumental in delivering innumerable atheists. Syamananda Pandita initiated many disciples in Balarampur, Nrsimhapura (present-day Kanupur), and Gopiballavpur. Among his disciples and grand-disciples were Kisori das, Dina Bandhu, Nimu Gopa, Hari Gopa, Kanai Gopa, Damodara (previously was a mayavadi sannyasi), Rasikananda Murari (son of king Achyutananda), Rasikananda’s wife Syamadasi, yadunatha, Ramabhadra, Jagadisvara, Dhruvananda, Purusottama, etc. The great acharya, Sri Syamananda Pandita, along with Narottama Thakura and Srinivasa Acharya, had filled up the vacuum created by the disappearance of Lord Caitanya, Nityananda and Advaita Prabhu. The samadhi temple of Syamananda Pandita is located here at kanupur (previously called Nrsimhapura), in Mayurbhanj district of Orissa. The place is quite near to Balasore. 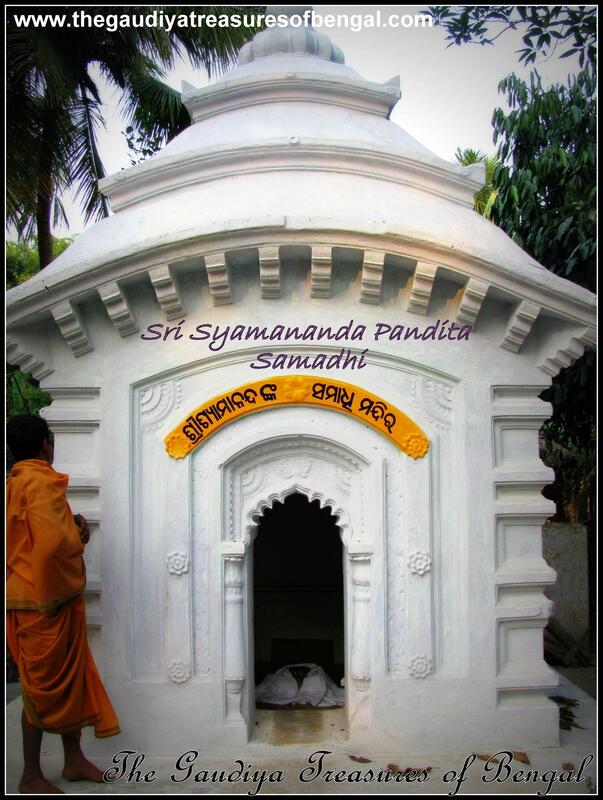 The temple compound houses Sri Syamananda Prabhu’s samadhi as well as his Bhajana kutira. 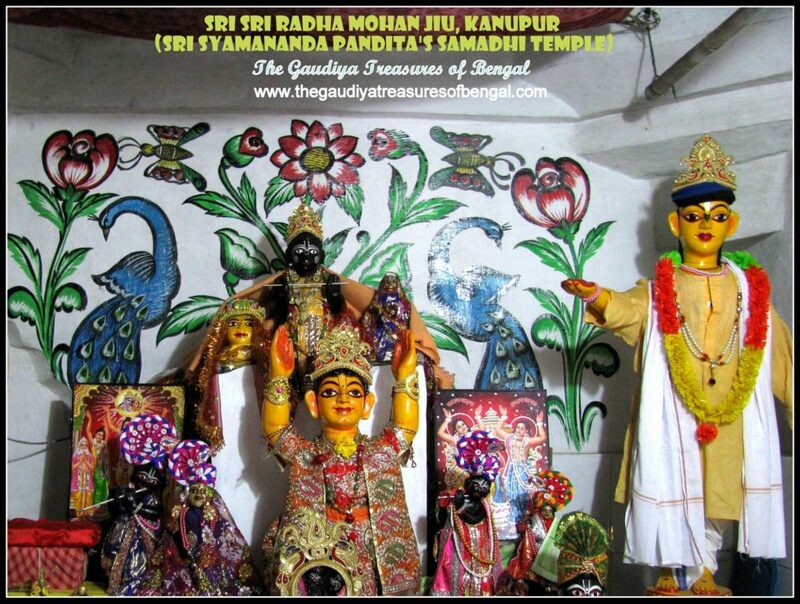 One can make his life successful by taking darsana of Syamananda Prabhu’s worshipable Radha Mohan jiu deities here.’The Gaudiya treasures of Bengal’ considers itself very fortunate having visited and prayed at this exalted destination. 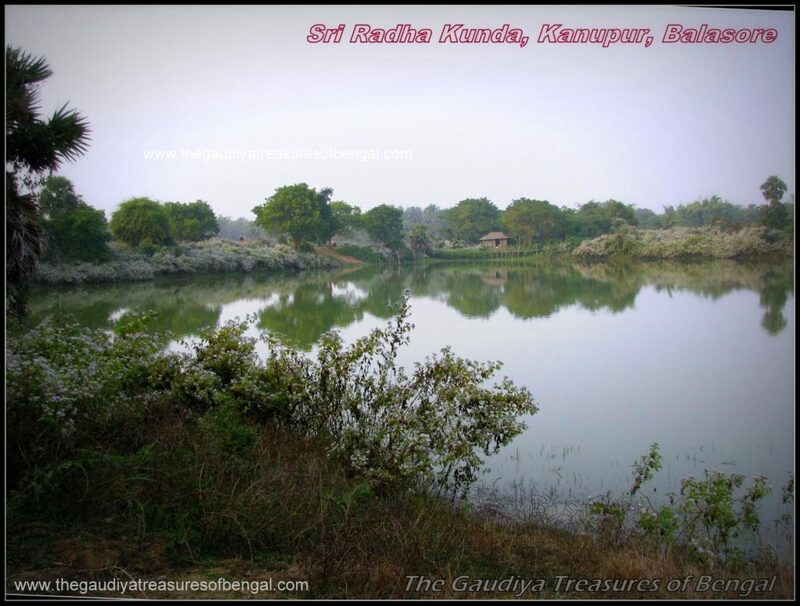 This place is also renowned as Gupta Vrindavana, as Sri Syamananda had dug up two ponds over here, in which he had installed Sri Radha Kunda and Syama Kunda. There is a beautiful Tamala tree at the very center of the temple premise that adds to the charm of this beautiful place. The worship of the deities and the maintenance of the temple are taken care of by the disciples of Syamananda Prabhu. The cost is borne by farming of the surrounding agricultural lands, that the temple owns. There is a beautiful pastime of Sri Radha Mohan jiu that the local devotees mercifully related to us. It is said that once, when there was no one to farm the temple agricultural lands, and the pujari (priest) was also very sick, Sri Mohan jiu had Himself taken the charge of farming and planting in these fields. The next morning, when everyone discovered, how beautifully the lands were plowed, they congratulated the pujari, who was taken by utter surprise. The priest was completely unaware and denied plowing the fields the last night. The mystery was solved when the devotees discovered the hands of the deities covered with mud. The missing flute of the deity was found from the plowed farmlands. There stands a sacred Tamal tree at the very middle of the temple premises. This place is also called Gupta Vrindavana, as Sri Syamananda had dug up two ponds ,where he had installed Sri Radha Kunda and Syama Kunda. The place is exceedingly remote, far away from the monotony of the busy city life and came across as highly spiritually surcharged. All the villagers happened to be Gaudiya Vaishnava devotees ,adorning tulasi neck beads and marks of tilaka and on their bodies.They have fully dedicated their lives unto the service of Sri Sri Radha Mohan Jiu. The temple, however,seemed to be in the dire need of funds.This site needs to be urgently renovated, and the service of the deity restored to the best standards.‘The Gaudiya Treasures of Bengal’ hence appeals to all the devotees, to come forward and contribute generously to revive this holy dham and propagate its glory to the entire world. We worship the lotus feet of our spiritual master ,whose causeless mercy has empowered us ineligible fools ,to gain entrance and take up service in this sacred abode of Kanupur. We seek shelter of this holy land, and pray that its glories remain forever imprinted in our heart.‘The Gaudiya Treasures of Bengal’ offers millions of obeisances and humbly prays to Sri Syamananda Prabhu that we advance in our Krishna consciousness, develop attachment unto the lotus feet of Lord Gauranga and are able to serve Sri Guru & Vaishnavas, by our honest and sincere efforts. We seek his blessings and compassion , in successfully rendering this humble service of reciting the pastimes and revealing the pastime places of the Supreme Lord and His beloved associates.We shall consider ourselves greatly fortunate and our existence meaningful if Lord Gaurahari and our dear spiritual master are kindly pleased with our endeavours. This place is a 1.5 hours journey from balasore. A nearby landmark is Amarda Road railway station , which falls in the Howrah-Puri line.The place is located in the Mayurbhanj district of Orissa. Reaching the Amarda Road station, one needs to ask for directions to reach the temple. The local people refer to this place as the ‘temple at Kanupur’ (previously known as Narsimhapur). The devotees are requested to contact the temple authorities to arrange for their prasadam. 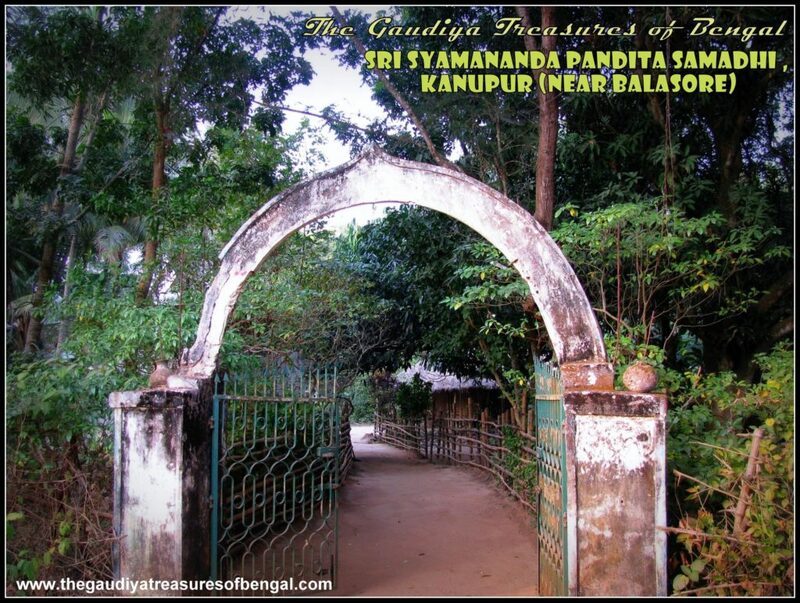 Sri Syamananda Pandita’s Bhajana Kutira at Kanupur is atleast an hour’s ride from Balasore.